McDonald's Prosperity Burger Is Back With A Twist(er) On The Side! The Prosperity Burger IS FINALLY BACK! McDonald’s has always been a go-to comfort food for Singaporeans. Convenient, affordable, and always consistent in great taste, McDonald’s has hundreds of outlets all over the island so that we can get our fix anywhere. While we love the McSpicy, the French Fries, and of course the curry sauce, what we love best about McDonald’s are the special promotions! From Twister Fries to the exclusive Hello Kitty plushies, McDonald’s keeps us constantly salivating (and queuing) when it comes to their exciting new offerings! Chinese New Year is upon us and that can only mean one thing… THE PROSPERITY BURGER IS BACK! Blessing us with its yearly appearance once again, the Prosperity Burger has become a favourite among Singaporeans, many of whom wish that it isn’t just a time-limited menu item. Because really, what’s not to love about the Prosperity Burger?Dipped in a generous serving of fragrant black pepper sauce, the succulent grilled beef or chicken patty is topped with slivered onions and served in-between soft sesame seed buns. What’s a meal without a little appetizer on the side? The long-awaited Twister Fries also makes its come back this festive season! Lightly coated with the right amount of seasoning, it’s no wonder that the Twister Fries is a crowd-favourite. 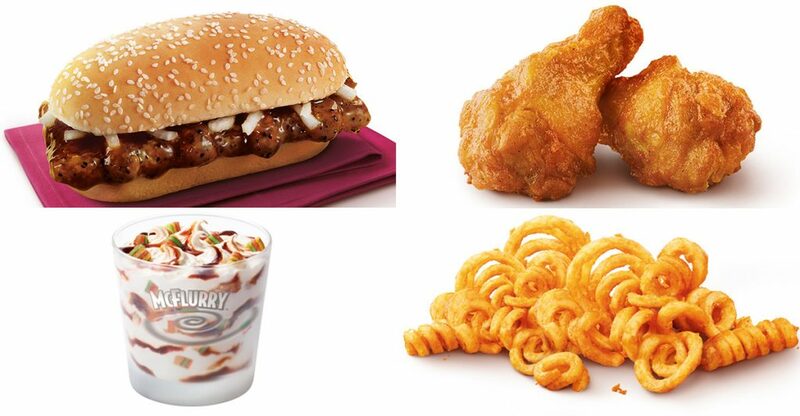 Not just the Twister Fries, this new year, McDonald’s is spoiling us with even more exiting food. Complete your meal with a set of sweet and savoury BBQ Drumlets. Available in 2 and 10 piece options, these juicy mini drumlets will have you fighting with your meal buddies for more! Ending the meal on a sweet note, McDonald’s also offer Gula Melaka McFlurry with Rainbow Bites, that hits all the right spots in the most local way ever. This limited-time-only treat gives that extra bit of sweetness that goes oh-so-well with the classic vanilla ice-cream. Topped off with Rainbow Bites, this dessert is the perfect end to a satisfying meal! So one thing’s for sure – we are super excited about Chinese New Year already, and we can’t wait to lay out hands on the new Prosperity Burger after one full year! Also Read: Count Yourself As A True Blue Singaporean Only If You Have Tried These 9 Local Dishes!